Brno, Czech Republic is the perfect base for any traveler in the Czech Republic. 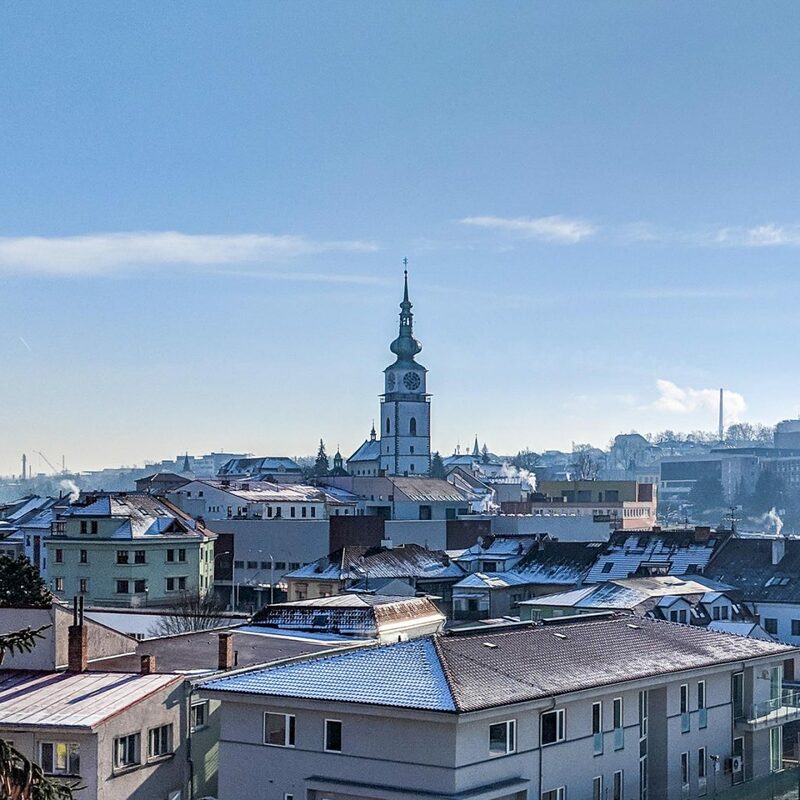 Near other capital cities like Vienna and Bratislava and cheaper than Prague (a short train ride away), Brno serves as a great place to stay and also a great place to take a day trip! While Brno, Czech Republic, deserves its own post on things to do, that will come later. 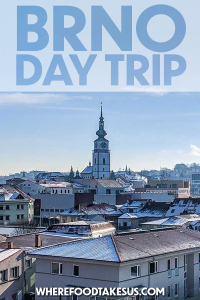 In this post we’re going to talk about our Brno day trip. You can see our day trip route on the map below. Some people may be apprehensive to the idea but driving in a foreign country is the best way to see it for yourself. Granted, we never drove in Taiwan or Bali because the scooters everywhere are intimidating, but the Czech Republic is fine. The plus side here is that a rental car only cost us around $30 USD for two days. A sweet deal! We have an International Driving Permit but the rental car company, Budget, only needed a driver’s license. The International Driving Permit is more for an encounter with the authorities as some countries will throw a hefty fine at you if you don’t have one. Therefore, we think it’s a good idea to carry one. The IDP is more security for you and only runs $20 USD. You can find more information on an IDP for US citizens on travel.state.gov. After a painless car pickup at the Brno-Tuřany Airport, our road trip in the Czech Republic began! We didn’t have any real concrete plans, our main goal being to see as much of the Czech Republic as we could. Our day trip from Brno began in a westerly direction, having heard about a cool Renaissance town that had been very well preserved. Highway 23 was our exit from E50 (the major highway) and this took us all the way to Třebíč, about an hour drive from Brno. Not only did we pass small quaint towns along the way, every single one with a pretty church, but we also saw hills upon hills of snow. 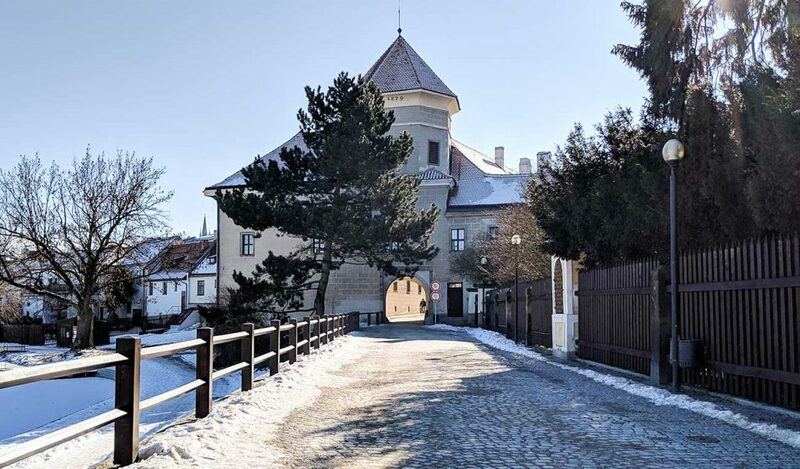 Třebíč is a treasure in its own right. At first sight this city seemed a little industrial and uninviting but that wasn’t the case! It did go through a large growth spurt during the Soviet era so that explained why its industry was more prominent. 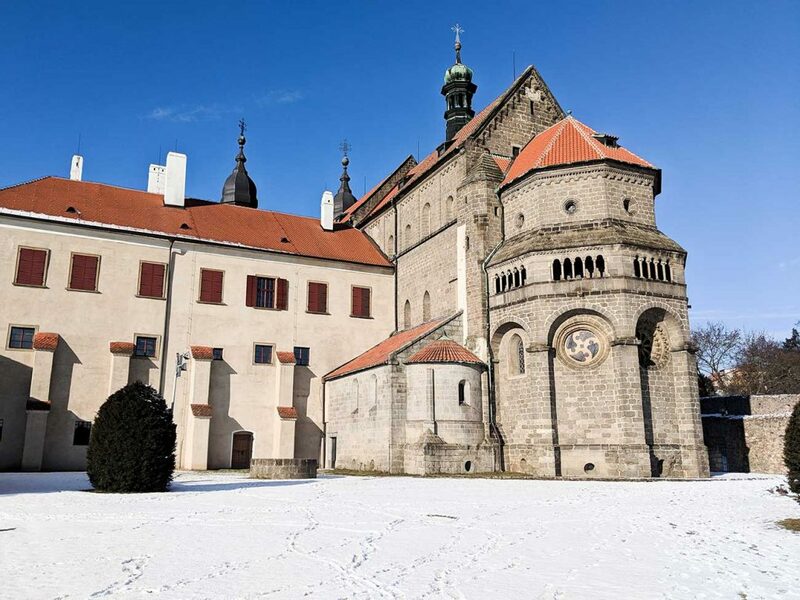 Třebíč boasts two UNESCO heritage sites. One is St. Procopius Basilica and the other is the Jewish Quarter. 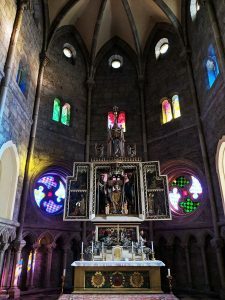 The basilica, dating back to 1101 AD, is connected to a 16th century castle which houses a very cool museum. Both the museum and St. Procopius Basilica are worth your time and have an entry fee of about $5 USD per person. 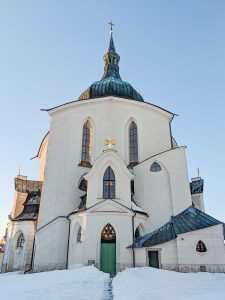 The tour for St. Procopius Basilica is in the Czech language but handouts in English and other languages are provided! One of the coolest features of St. Procopius Basilica is the Romanesque portal, “Porta Paradis”. 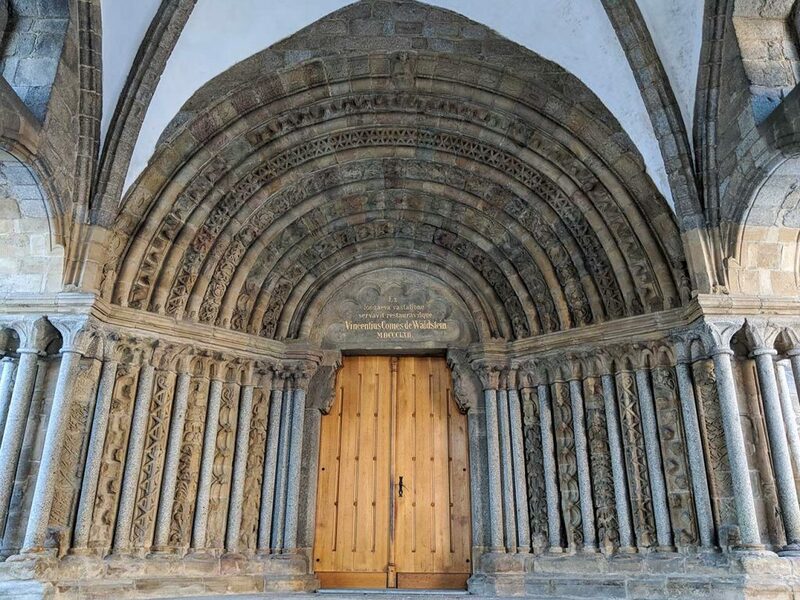 It’s the entrance to the basilica and is made of sandstone, dating back to the 1200s. Another interesting part of the St. Procopius Basilica is the crypt. Dating back to 1230, the layout is that of a cross. 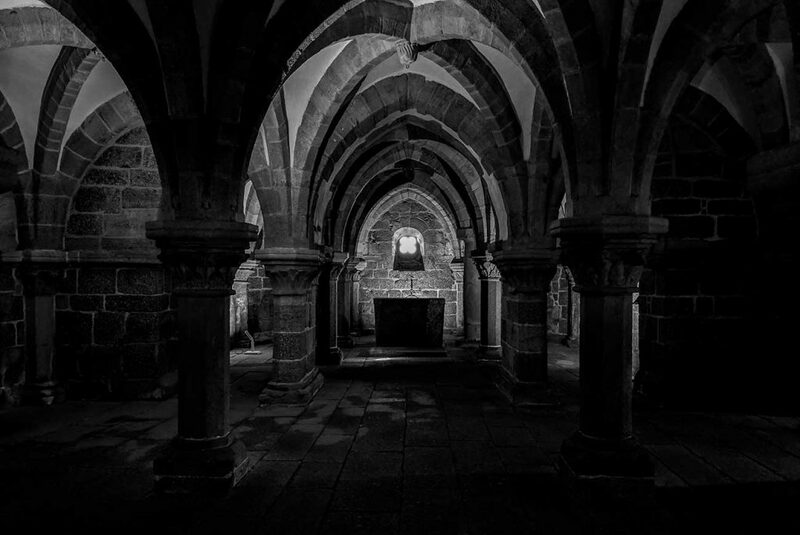 The crypt also served as a brewery at one point. History is interesting! We knew our time was limited, so after spending a couple hours exploring Třebíč, we returned to the car and continued west. But not before we grabbed kolač! 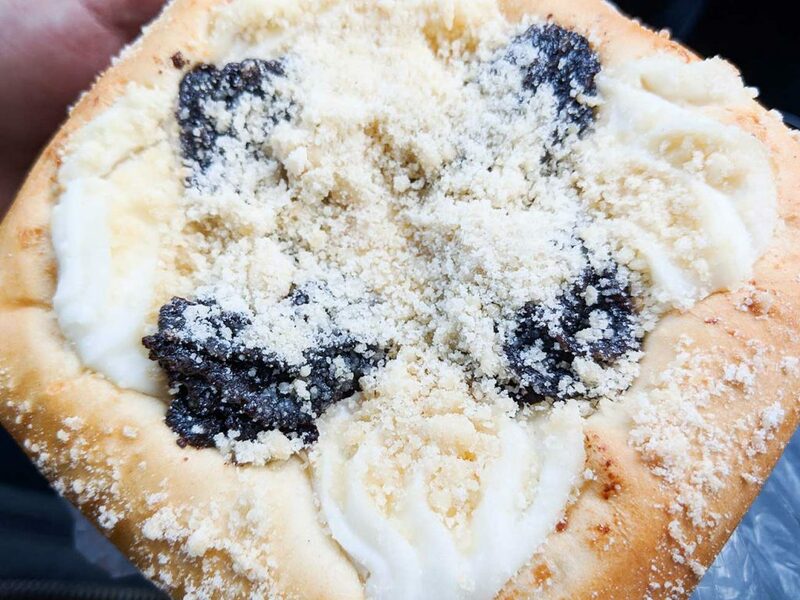 Unlike the popular “kolaches” in Texas or elsewhere in the United States, a koláč in the Czech Republic is filled with poppy seeds or fruit and sometimes a sweet cheese. It was so delicious! Our day trip from Brno was already a success but we had just begun! Telč is the town we heard about beforehand. Its main square and many of the surrounding structures are all a UNESCO heritage site. It’s also one of the best preserved towns in the style of the Italian Renaissance. We were excited, to say the least. Which was why we were pretty disappointed when we found Telč to be asleep. 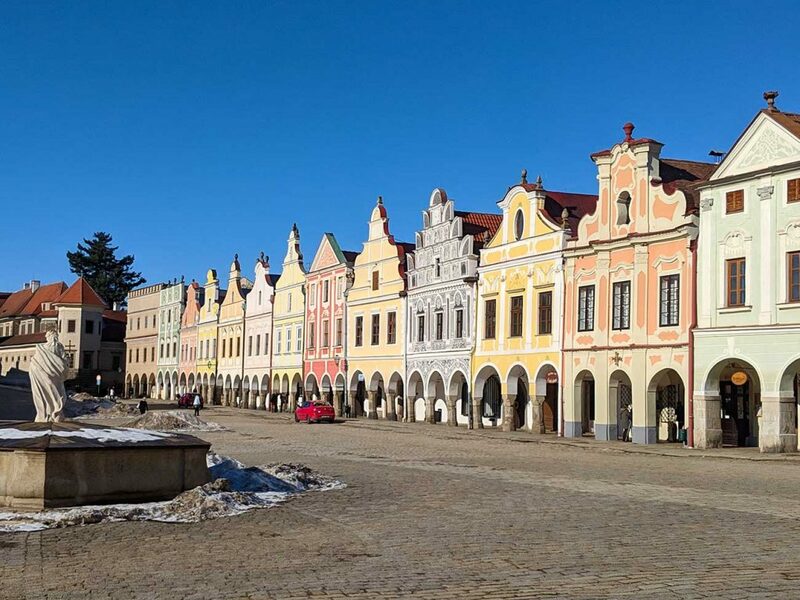 It was the off-season and Telč is definitely a tourist area nowadays, with all its history and pretty main square. However, we expected at least something to be open. It was early afternoon and a few cafes were serving food and drink but the church and the castle had locked doors. That’s not to say this town isn’t worth seeing. Just walking around the square is enjoyable and it’s a great spot for photos. Our time in Telč was short, but we still admired the town by the exterior. 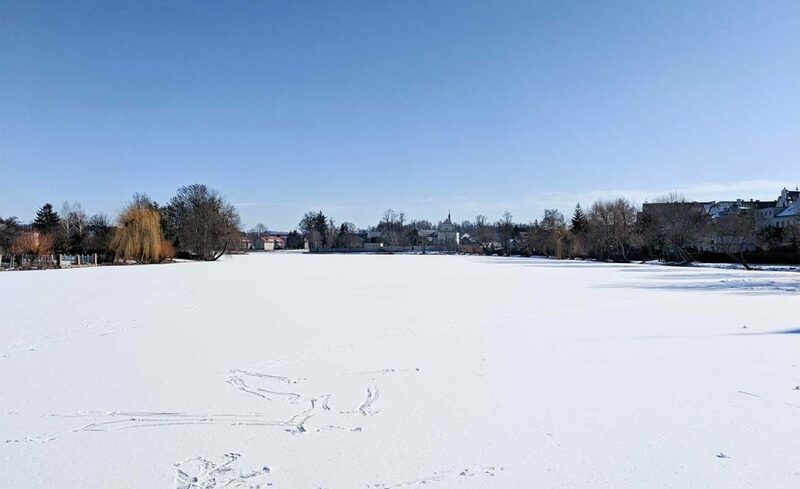 There’s also a beautiful pond that borders the town square and entrance, but it was frozen solid! 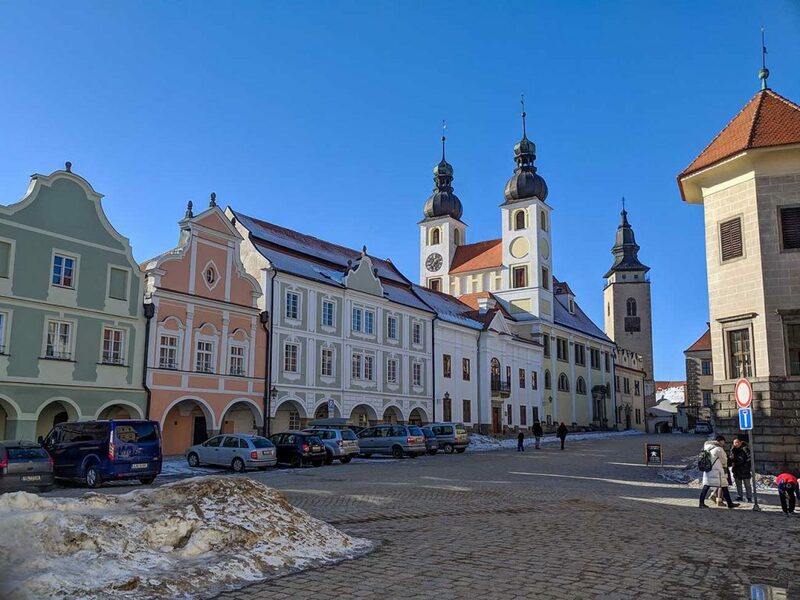 Telč really seems like a special town in the Czech Republic and worth visiting so we recommend going during the warmer months. Say what? Yeah, we’re not great at pronouncing this one either. It’s a nature reserve in the Czech Republic, an hour and a half drive north of Telč. Our plan was to see some nature and head back to Brno by nightfall. The unfortunate thing about it being winter is the amount of daylight. The sun sets pretty early so we had to get a move on! This nature reserve had so many outdoor activities going on in the midst of the snowy fields and tall pines. 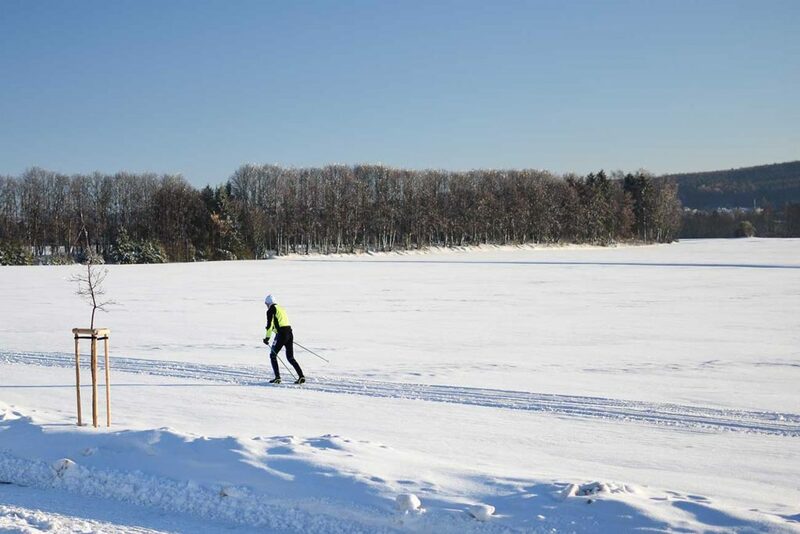 From downhill skiing to sledding to cross country skiing, we saw it all. It looked like an awesome spot for some winter relaxation and fun. 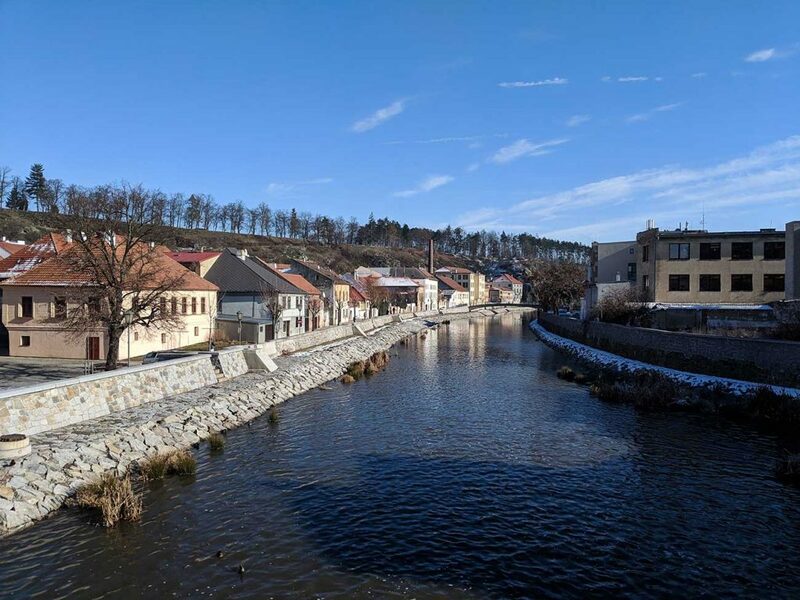 After taking our time driving through the nature reserve, stopping for pictures as we went, we arrived at Žďár nad Sázavou. 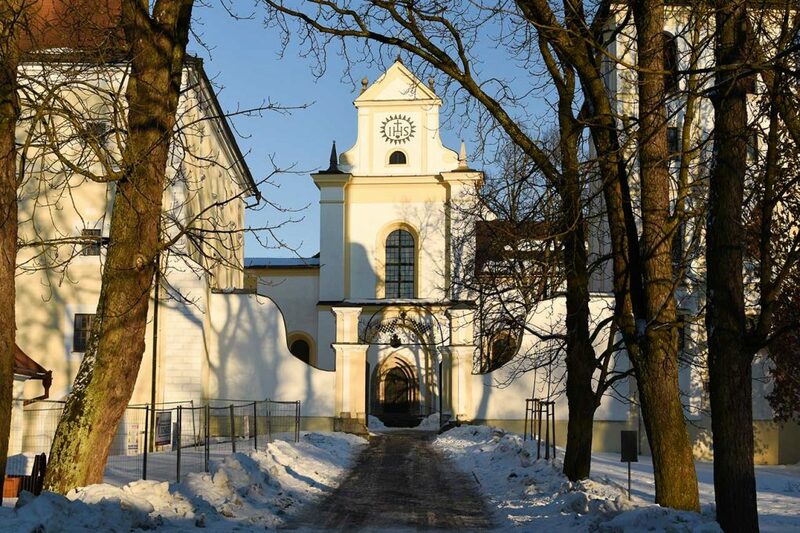 This picturesque town, located within the nature reserve, hosts two churches: Basilica of the Lady of Our Assumption and St. Nicholas and also the Pilgrimage Church of St. John of Nepomuk. Sadly we were unable to enter either church, most likely due to the time of day; it was almost dusk. 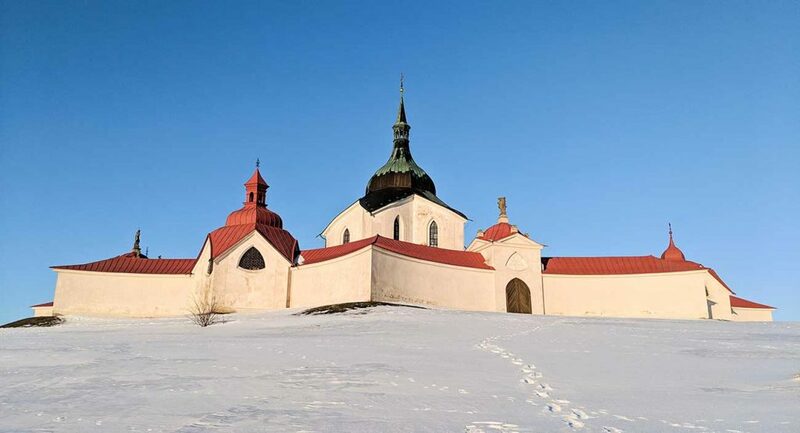 The Pilgrimage Church of St. John of Nepomuk, another UNESCO heritage site which was built in the 1700s, sits upon a hill overlooking Žďár nad Sázavou. 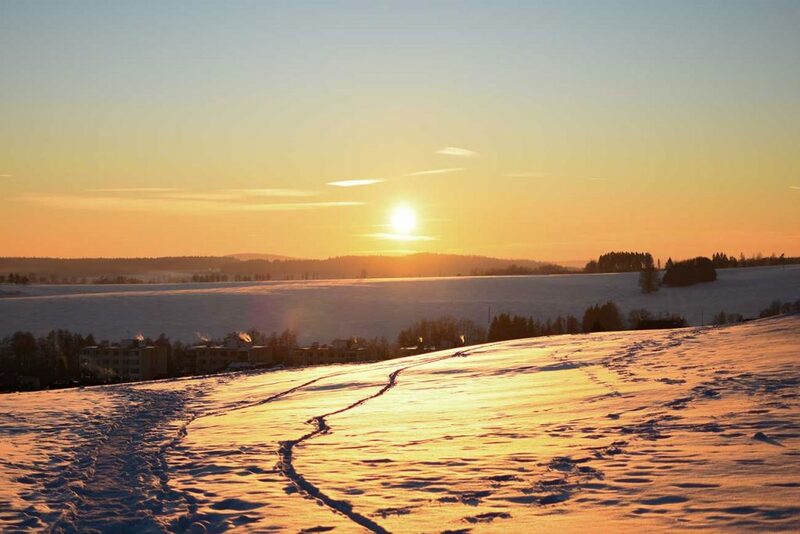 It’s a beautiful place to be, especially while the sun sets in the snowy distance. The circular church courtyard is a cemetery, which was hidden under a blanket of snow. 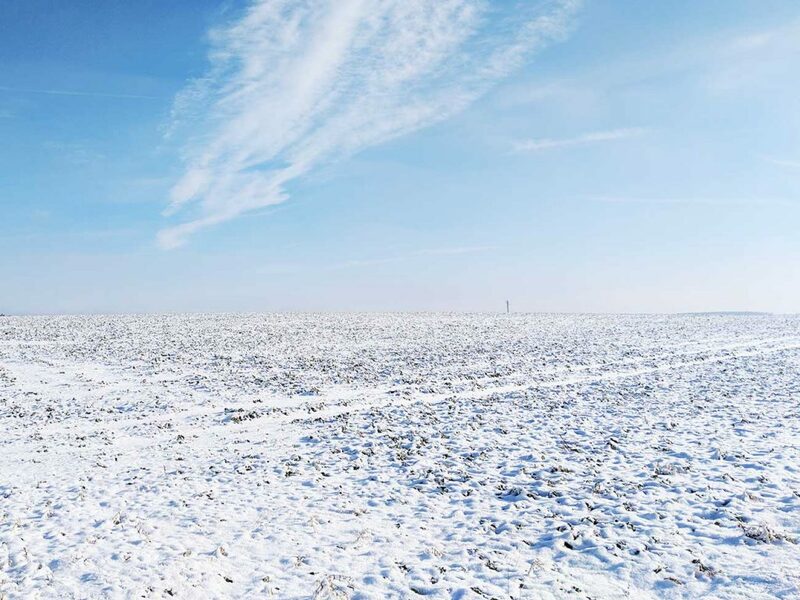 We hope to come back in another season to admire it in warmer fashion. However, the cold didn’t bother us. We watched the sunset in the distance as some local families were sledding down the hill beside us. It was a great end to our day trip from Brno. Thankfully so. We were pooped. Thus ended day one of our Czech Republic road trip. All in all we drove about 5-6 hours and covered 269 km (167 mi). As was the case in Hawaii and the mainland US, driving our way through the Czech Republic was an amazing experience. Every hill had a surprise behind it, whether it be a small village in a snowy valley or a chateau off in the distance. Brno, Czech Republic, is a day trip paradise. Keep an eye out for round 2 of our day trip from Brno, which was a longer distance and we saw several castles and chateaus up close!